President Trump announced for the first time today that he supports a "two-state solution" to the Israeli-Palestinian conflict, and the founding of an independent Palestinian state. Following his meeting with Israeli Prime Minister Benjamin Netanyahu, he also said he would be presenting his long awaited peace plan in 2-4 months. Why it matters: The Palestinians have been anxiously waiting for Trump to say this. In the 20 months since he assumed office, Trump refrained from supporting the two state solution even though presidents Clinton, Bush and Obama all supported a Palestinian state. Trump has been urged by Arab and European leaders — mainly King Abdullah of Jordan — over the last few months to pledge support for the two state solution. Trump also stressed that he wants to get a deal between Israel and the Palestinians before the end of his first term in office. He also said once again that Israel will have to make concessions to the Palestinians because the U.S. has already moved its embassy to Jerusalem. Trump said: "That's a big chip that they got. We have to make a fair deal. Deals have to be good for both parties. Otherwise, you don't have a deal and you don’t have a lasting deal". 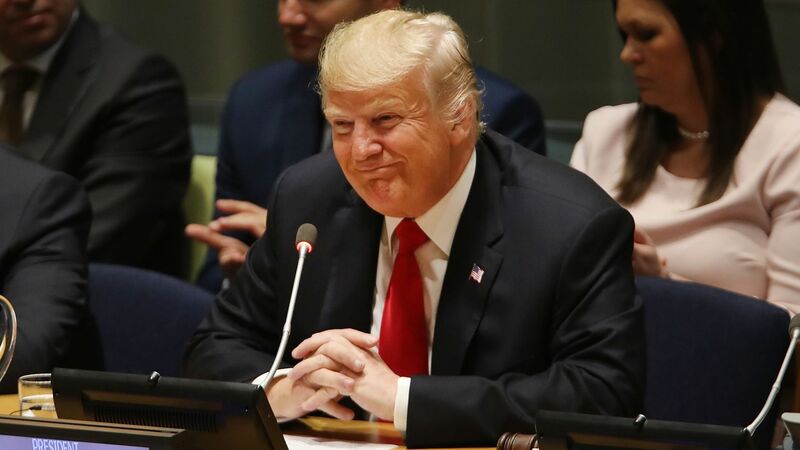 Despite the fact the Palestinians have been boycotting the White House since Trump's embassy announcement, Trump sounded confident and said he they will come back to the table "100 percent". In a briefing to Israeli reporters after the meeting with Trump, Netanyahu said he was not caught by surprise by Trump's statement. Netanyahu said he told Trump that what matters is the substance and not the term. Netanyahu said Jared Kushner, who is leading the U.S. "peace team," told the President during the meeting that different players have different interpretations of the term "Palestinian state." Netanyahu said he reiterated Kushner's remark and told Trump that the question will be whether the Palestinian state will be "more like Costa Rica or more like Iran." "I told the president that any future Palestinian state must not have the ability to threaten Israel and that the overriding security responsibility should stay in Israeli hands. I am sure that every U.S. peace plan will reflect that." Palestinian President Mahmoud Abbas's spokesman Nabil Abu Rudeineh commented on Trump's: "The road to peace goes through a two-state solution with the state of Palestine on the borders of 1967 with East Jerusalem as its capital. This is an Arab and an international position." What to watch: Tomorrow, Palestinian president Mahmoud Abbas will give a speech at the UN General Assembly. Abbas arrived in New York with the goal of rallying the international community against Trump's peace plan. He even organized an Anti-Trump meeting with representatives from 40 states. It will be interesting to see if Trump's overture towards Abbas and the Palestinians will be reflected in the Palestinian president's speech.